The ball valve design and manufacturing due to the application of computer-aided design (CAD) and computer-aided manufacturing (CAM) and flexible manufacturing system (FMS) in the valve industry, so that the ball valve design and manufacturing to a new level. Not only overhaul the valve design and calculation methods to reduce the repeatability of the conventional design of heavy professional and technical personnel, technical staff have more energy to be used to improve, improve product performance and new product development, shorten the new product development cycle and comprehensively improve labor productivity, but also in research and development process of the lift rod metal sealing ball, due to the application of CAD / CAM computer-aided design, manufacturing computer-aided CNC machining stem spiral flat metal seal Ball in the opening and closing process without any scratches and wear, so that the ball valve seal life greatly improved. 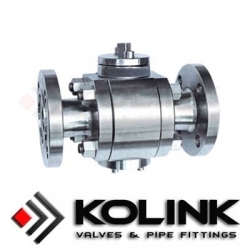 The ball valve when fully open, the flow resistance is very small, almost zero, and other Stainless Steel Ball Valve are widely used in oil and gas pipelines, because it is easy to clean up the pipeline. The ball valve in the opening and closing process with a wipe, so most of the ball valve can be used with suspended solid particles of the medium, in accordance with the gasket material can also be used in powder and granular media.